What Is DD Form 2766? DD Form 2766, Adult Preventive and Chronic Care Flowsheet is a service-specific patient problem list, consolidating the health condition information to provide streamline care delivery and meet all standards of care. 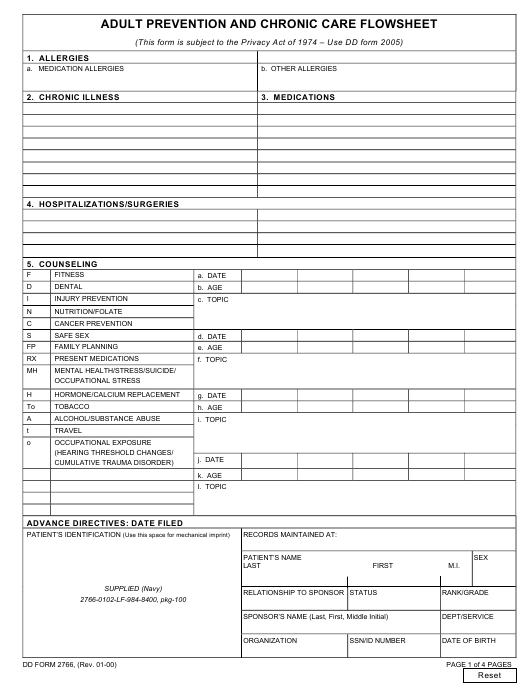 This form is utilized in Armed Forces Health Longitudinal Technology Application (AHTLA) for active duty, U.S. Army Reserve (USAR), and Army National Guard of the United States soldiers as well as non-active duty adult beneficiaries, civilian employees, and contractors receiving care in Military Treatment Facilities (MTFs) as part of their employment. The latest edition of the document - commonly incorrectly referred to as the DA Form 2766 - was released by the Department of Defense (DoD) in January 2000. An up-to-date DD Form 2766 is available for download below. As of today, no copies of the form can be found on the Executive Services Directorate website. The DD Form 2766 - along with the SF 601 and CDC Form 731 - belong to a series of forms related to immunization. This form is distributed with the DD Form 2766C, Adult Preventive and Chronic Care Flowsheet (Continuation Sheet), which provides additional space for the information required by the main form. How To Fill Out Dd Form 2766? The form can be used in two ways: either as a folder or as a cut-sheet. The folder-version of the DD 2766 is used for active duty personnel. During deployments, the form serves as a treatment folder. The cut sheet is used for non-active duty personnel. This version consists only of the first two pages of the form. When using the DD 2766 as a cut sheet, all of the immunization documentation should be done on the SF 601. The identification block can contain either the stamp from the patients recording card or an ID label. The other required data should be entered manually. Block 1 requires any taken medication and any allergies within the recorded time frame. Block 2 should contain a list of all chronic illnesses the patient may have. Block 3 - Medications - should be completed in ink and must contain a list of names and starting dates of prescribed medications except for those taken for acute and short-term illnesses. Block 4 should contain the data about any prior hospitalizations and surgeries with their dates. Block 5 is for recording the counseling. The lines titled "Date," "Age," and "Topic" should be filled in only during the annual prevention assessment. Block 6 is for family history. Any of the listed diseases the patient's relatives may have had need to be recorded in the corresponding lines. Block 7 - Screening Exams - contains the list of medical exams ranging from general to specific. This block requires the age of the patient at the moment of the examination along with the date of the test performance and its results. Block 8 should contain information on any exposure hazards. Block 9 is for the information on the immunization the patient has already had. Block 10 is for the readiness information. Block 11 - Pre/Post Deployment History - should contain the date of each deployment and the location and date of each evaluation. However, the record of deployment for classified operations will be maintained only in the personnel folder.